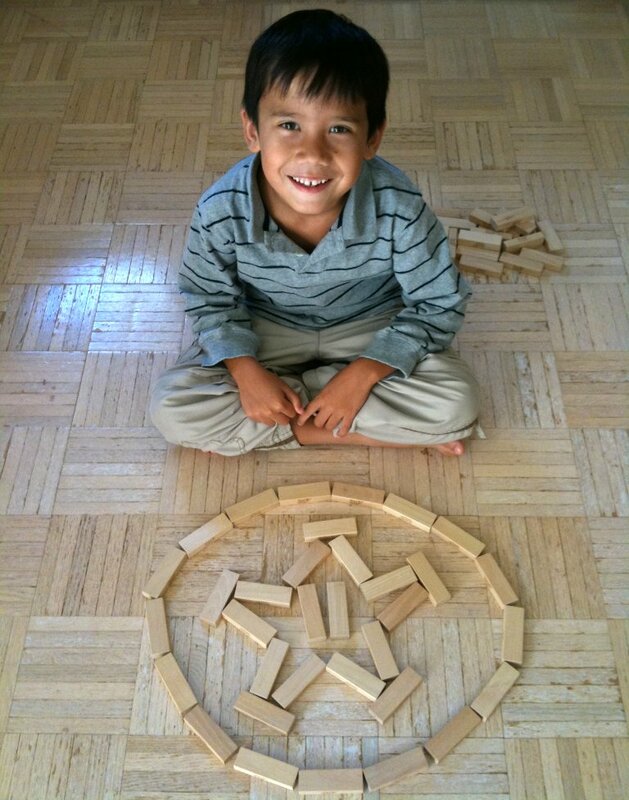 Aaron, our six-year-old, was browsing instructional art videos on YouTube. The art subject of choice was Mario, of course. He knows how to do this sort of thing himself. After logging in to his account, he launches his web browse, and types “youtube mario” in the Google Search field to get to YouTube. After that, he’ll type “draw mario” into the YouTube search box, and he’s off and running with his instructional videos. His mother and I were in another room when we heard him get frustrated a few minutes later. I knew right away what had happened. He’d navigated from a YouTube clip of somebody drawing Mario with a pencil to one doing it in Microsoft Paint, and he wanted to try it out himself. I ran to him. He was on a Windows PC, so he obviously had Paint, but there was no telling where he was looking for it. When I got to him, I saw that he’d typed variations of “ms paint” into the Web Browser’s search box and into YouTube’s search box about a dozen times. Poor kid. He was searching for Microsoft Paint in the only places on the computer he knew. Wasn’t everything on the web? Aaron’s a great Super Mario Galaxy player. He’s gotten all 121 stars over and over again. Now he’ll start playing the game just to pass the time. He’s even found a glitch in the game. It’s pretty much all he wants to do. Bringing him outside to play catch or go for a bicycle ride is like asking him to do homework. Everything seemed fine. Maybe he really could entertain himself without obsessing about Super Mario Galaxy. He drew a Grand Star in Jenga pieces. This weekend, the whole family went to San Mateo County Memorial Park to celebrate the birthday of one of Madison’s friends. Aaron and I took the opportunity to go on an adventure in the park, on our own, away from the girls. We went straight to the creek, and wound our way along the trails following signs to the Tunnel Tree and the Largest Tree. There were plenty of fascinating trees with burnt-out trunks in which to explore and lots of paths leading off towards unimagined adventures. 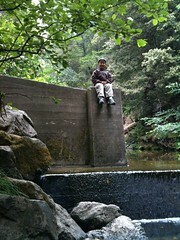 The photo here captures Aaron sitting at the end of a concrete wall a few feet above the water just before a spill-over. He had to walk carefully along the edge of the wall to make it to the pylon. This is what he and I deemed “the most dangerous part of our adventure”. Seeing as how this was on Valentine’s Day, I thought that that was an unusual word for a valentine. But I spell it out for him anyway: D, A, R, E.
Yeah, well, that didn’t help at all. So I asked him to use it in a sentence.